Don’t you love when you have the best weekends? Me too! I mean, I’m on maternity leave so every day lately feels weekend-esque, but the weekends are still so much more enjoyable when we’re all home together. Plus, it was Mr. Prevention’s birthday weekend and we took advantage of my in-laws being in town. Frankly, we needed that 1:1 time. Desperately. We went to a petting zoo and walked the farmer’s market and that afternoon, we swung through a wine festival with live music and had a beer in a beer garden (both kids were perfectly behaved!) and later that evening, Mr. P and I went out to watch some football, just he and I.
Sunday was Mr. Prevention’s actual birthday – 36 years young! He joked (or so I thought) that he wanted to jet ski for his birthday. Ends up, it was 81 degrees and he was most certainly not joking. With much hesitation, I agreed to go – I mean, it was his birthday and my gift to him was a card and some peanut butter M&M’s (I’m so original and thoughtful, I know…). But it was perfect – fun and absolutely beautiful out. We got home for some pizza, cake and ice cream and with her birthday coming up next, Shea helped daddy blow out his candles. It was too cute. And to no one’s surprise, she loved the cake and ice cream. Sigh. Today feels like a Monday after that much fun over the weekend. Tonight, we’re firing up the grill to prepare the last of our garden’s haul. Or what we believe to be the last…of the peppers, anyway. I think our zucchini have finally come to an end and the tomatoes are wrapping up, as well. The butternut squash, however, are still plentiful and growing. When we were running low on zucchini recipe options, I found this recipe on Pinterest. Of course I tweaked it some, including more vegetables – bell pepper and onion and in lieu of ground turkey, opted for the more flavorful sweet Italian turkey sausage – yum! With my pizza-loving family and zucchini over-load, this recipe was perfect. 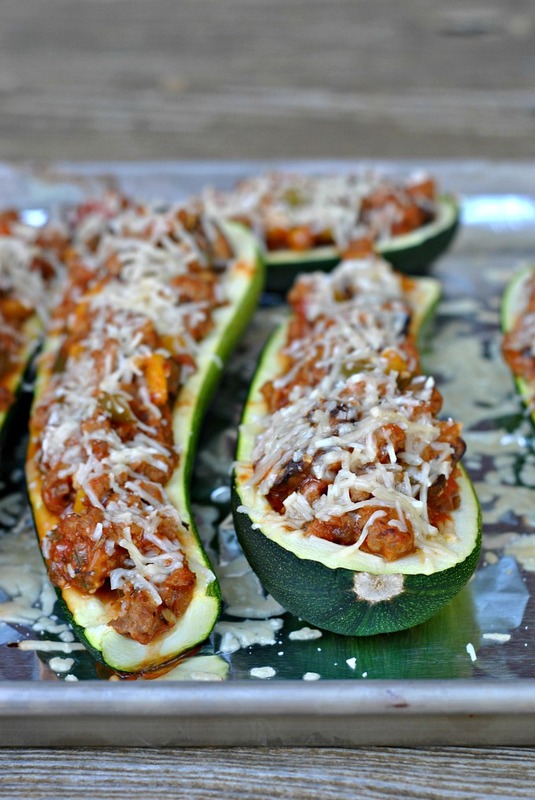 Two zucchini boats was a perfect, light meal with lots of flavor! 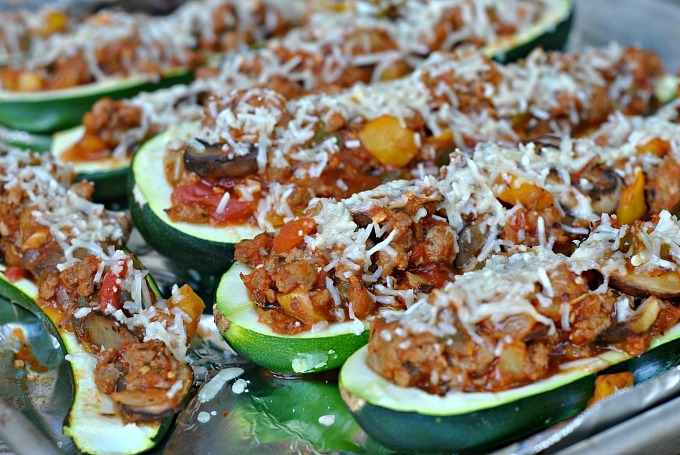 Preheat the oven to 400 degrees F. Using a spoon, scoop the seeds out of each of the zucchini halves to create a "well". Arrange zucchini cut side up on a baking sheet and bake for 10-12 minutes; remove from oven. Meanwhile, heat the olive oil in a large skillet over medium heat. Add the turkey and cook 6-8 minutes, breaking up with a wooden spoon, until no longer pink. Using a slotted spoon, remove turkey to a plate and set aside. To the hot skillet, add the diced bell pepper, onion, and mushrooms; cook for 5-6 minutes or until softened. Add garlic, oregano, and basil and cook until fragrant, about 30-60 seconds. Add marinara and stir; cook for 4-5 minutes or until hot. 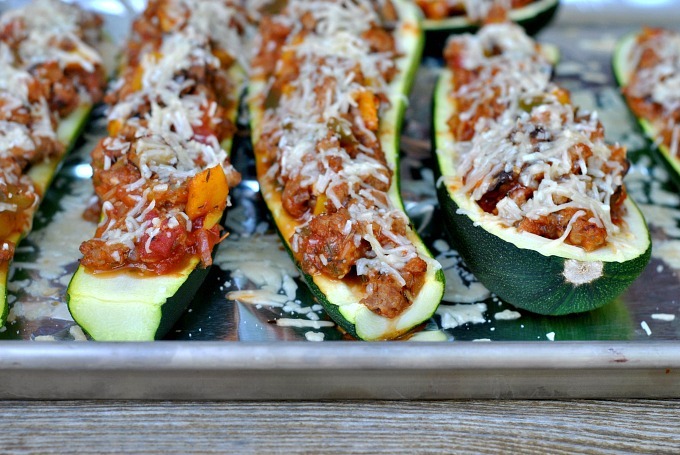 Fill each zucchini with the turkey mixture and top with grated Parmesan and mozzarella. 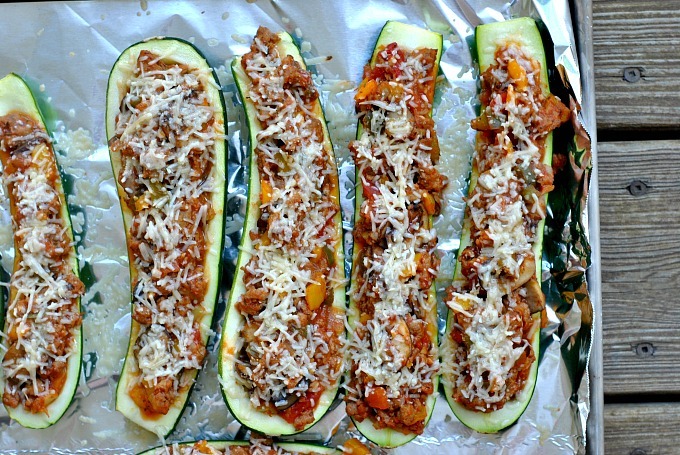 Bake for 10-15 minutes or until cheese is turning golden and zucchini are tender. Serve hot. 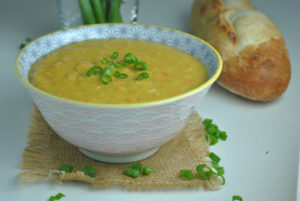 just wanted to say ‘thanks’ for a great recipe. I am a full-time working woman who not only loves to eat healthy but insists on it. 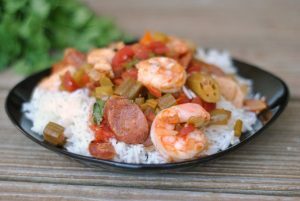 This recipe is not only yummy, easy to make BUT has the perfect combination of fats, protein and carbs … thanks again.